For the parents out there, you guys may have a new show that your kids rave about coming soon to Nickelodeon...courtesy of Gwen Stefani! 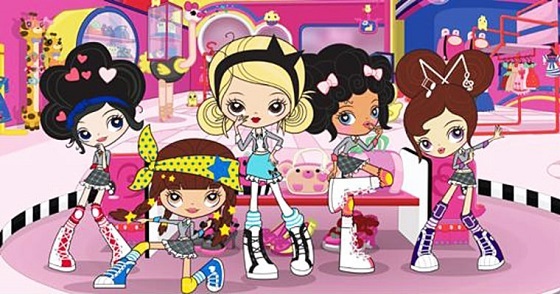 Gwen serves as the co-creator and executive producer of an upcoming show on Nick, called Kuu Kuu Harajuku, which taps into the singer's love of the Harajuku culture of Tokyo. "Stefani [has always had a] love of pop art and lifelong admiration for the street fashion and creative youth culture found in the renowned Harajuku neighborhood of Tokyo, Japan,” read a press release (per Us Weekly). "It was while writing her first solo album that Stefani created the original Harajuku Girl characters as a celebration of the creativity and individualism she saw and loved in the Harajuku District." The animated series, which has been tapped for 26 episodes, follows band HJ5 members, Love, Angel, Music, Baby and G, as they perform here and there as a group and face obstacles from "NoFun" politicians, their manager Rudie, and even monsters and aliens! All in all, it sounds like it might be a cute show for kids! Kuu Kuu Harajuku will air from Monday, October 3 to Friday, October 7 at 4 p.m. (ET/PT) on Nick. It will then air in its regular time slot on Saturdays at 8:30 a.m. And, as I've seen for myself, kids will definitely be up that early while we adults are still trying to sleep in! I might check it out with my little cousin, just to see what it's all about, though.